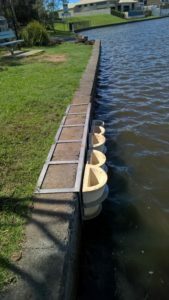 Redland City Council is trialling specialised ‘seapots’ in Sovereign Waters Lake, at Wellington Point, to encourage marine life and assess their potential to improve water quality. The first stage of the proof-of-concept trial involves 20 seapots the size of large flower pots, which have been attached to the lake’s seawall to create rock pools. Redland City Mayor Karen Williams said it was hoped the seapots, which retain water at low tide, would become refuges for a range of marine flora and fauna and lead to a substantial increase in their populations. “The seapots are designed to simulate natural rock pools and encourage the establishment of marine life such as algae, mussels, crabs and barnacles,” Cr Williams said. “Increasing the abundance and diversity of such species is known to improve ecological systems and will potentially improve water quality in the lake. “We will monitor the pots over the next 12 months to see what impact they have on increasing the abundance and diversity of species in and around the lake’s perimeter seawall. Councillor for Wellington Point/Ormiston Wendy Boglary (Division 1) said enhancing marine life in the lake would help to improve water quality. “Council will routinely measure water quality and turbidity to assess the lake conditions, as well as check on what is inhabiting the seapots,” she said. “While the scale of the trial is small, it is hoped the data and lessons learned from the project can be broadened and lead to improvements to the lake’s overall water quality. “Seapots have been found to more than double the population of mobile marine creatures when compared with seawalls alone, and that would be a great outcome for Sovereign Waters. Redland City Council is trialling seapots in Sovereign Waters Lake at Wellington Point.